While I am generally not fond of published price guides, I admit that they have a place in the collector’s world. They provide a snapshot of the coin market on the day that they were published and when compared year by year, they can give a state of that market at that point in history. Krause publication’s 2014 US Coin Digest is more, however, than just a published price guide. The book begins with a very handy visual type identification guide. A picture of each type of US coin in color is shown at actual size. This guides even the most novice reader to identify their own coin by type, and in my opinion, identification is key to being able to successfully research any item. I find it an attractive and rather unique feature of this book. I would have preferred showing obverse and reverse photos for the type coins, but alas the reverses are absent. The pictures are fascinating though in that you can see and compare the size of silver, gold, and copper coinage from the early US Mint through today’s coins. Handy information about organization and storage as well as caring for your collection are lightly handled, but well thought out. 10 Tips on buying coins and 5 tips on selling them are offered as well, but IMO, this information is like that of pricing, it’s fluid and markets are difficult to crystallize into useful bits. What worked yesterday, may not work today, but might tomorrow. Grading is also addressed and photo examples of common 20th century coins in circulated grades are featured for comparison. This is a most useful feature, especially to beginners, and to David Harper and Harry Miller’s credit, this chapter features coins that many beginners will be handling. Absolutely wonderful for helping people to begin grading for themselves which in my opinion is another key to their future success. 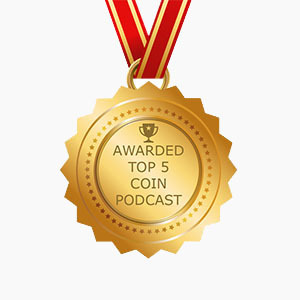 Hopefully it helps in paving the way to a lifetime of learning in coin collecting. The subject of grading uncirculated and proof coins is explained as a numerical scale and some TPG historical context is given, but is basically glossed over. Although many choices have been made for the purpose of containing the book’s length, I would have preferred a bit more focus here as I believe that many new collectors have high-grade modern coins, modern proofs and registry set collecting as their focus. A Chapter on How Coins Are Made describes the minting process and puts the US Mint in the context of being a factory that makes coins. Knowledge of the process of minting coinage is crucial to being a wise collector. The many steps involved and their exact order set the stage for understanding one of the most lucrative fields in coin collecting – errors. Coinage errors are one area that was NOT treated lightly in this book. I can honestly say that I was surprised and impressed with the section on US Minting Varieties and Errors. Rich in detail and possibilities, this section describes every type of planchet variety, die variety, striking variety, and Mint modification known to exist. It also gives estimates on the rarity of each type of error coin. This was something that I never expected, nor was I able to completely absorb in my first reading. Nor in my next 4! Some US Mint history rounds out the text and is illustrated beautifully by color photos of selected coins, and leads us into the catalog of coinage and values that composes the bulk of this book. Nearly every coin pictured in the price guide is in full color, with some exceptions in territorial gold. The color pictures of the coins are the stars of this book and bring this section to life as they jump off of the page at you. Which is actually, pretty awesome, as this is the section of this book that will see the most use. I must compliment Krause Publications on their use of color throughout the guide. I also like the hard-covered spiral binding, giving me the durability of hard bound, with the flexibility of spiral. As I stated in my opening line, I am not fond of printed price guides. It takes more for me to want a book for my library, and this book is more. It is a research tool, with well organized facts and figures at the ready, as well as a good read. I am certain that I will refer to it for facts and figures, but I will also turn to it for entertainment when I just want a good read. 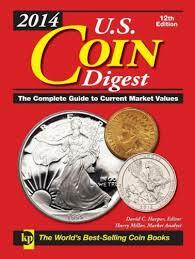 Printed price guide or not, I think that 2014 US Coin Digest is a fine addition to your numismatic library.